Whom Do You Ask for Help? The ESOL Academic Support Room is a popular place for both current and former ESOL students. Here Mr. Charles Wang is helping Claudia Villareal, Abdul Maiga, and Ranold Pearce with their math questions. In Montgomery Blair High School, there are many students from around the world. They are facing various problems in this new country. For many, the biggest problem is trying to do well in school. 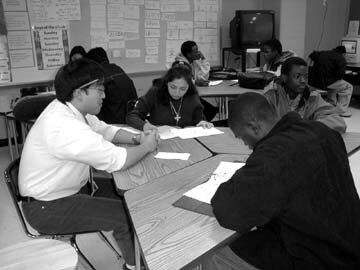 Almost 400 students in Montgomery Blair High School in the English for Speakers of Other Languages (ESOL) did not have much English in their background before they came here and for most, this usually makes it difficult for them to handle schoolwork. Silver International did a survey of intermediate and advanced ESOL students (levels 3, 4 and 5). The purpose of this survey was to learn what subjects are the most difficult for students from other countries who are learning English. We also wanted to know where they go when they need help. We gave out 100 survey forms and we got 70 papers back. From the papers, we found out that ten percent of the students have been in the USA for at least one year. Eighty percent have been here for one to three years. And ten percent of the students have been here for three or more years. Fifty percent of the students surveyed said that math is their hardest subject. From the survey, we found out that eighty percent of the students said they go to the academic support rooms or to their teachers when they have problems. Ten percent of them said they ask their friends for help. Ten percent ask their parents or others. For some students asking a classmate for help is easy. "In my math class, the teacher groups us at the tables. It's good because we can get an opportunity to work together. If either of us doesn't understand, we will ask each other and solve the problems together," Manwen Ye said. Other students don't think their classmates are serious enough about school. Kit, who is a senior, said, "Some of the students fool around and don't pay any attention in the class." In order to get better grades, Kit Jarunivej has his own way to study. "If I don't understand in my class, I will analyze it first. I will look back at my notes and other things," Kit said. "Then I will ask the teacher about what I don't understand." According to senior Ling Bei, the Montgomery County Commission for Children and Youth is concerned about ESOL students in high schools. They would like schools to set up mentor programs to help ESOL students feel more a part of the school. They believe student mentors can help ESOL students with schoolwork and also help them not feel so isolated. "The school will also feel more unified as a whole," Ling said. Ninety percent of the students surveyed think that a program like this would be a good program to try in Blair.